Guys I need certain restrictions to be imposed on specific devices at home. I want my brother and sister not to have access to internet after 11pm night and before 11am day. They use android phones and I got their phones MAC addresses. 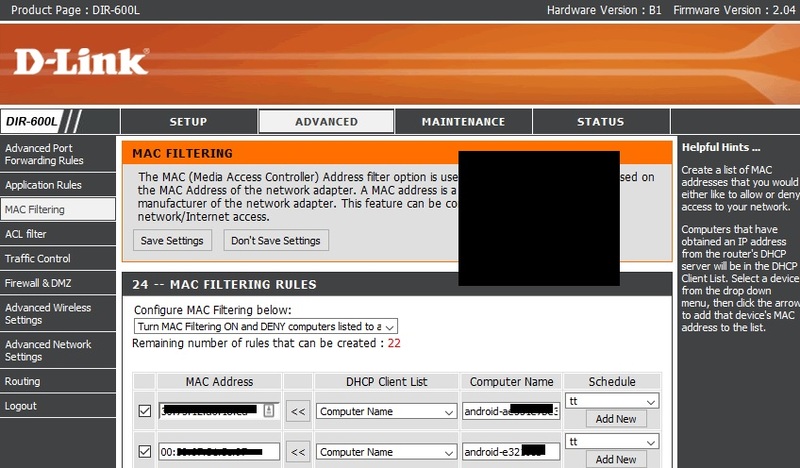 In my DIR600L I went to Advanced tab, MAC filtering and selected "Turn MAC filtering ON and Deny computers listed to access the internet"The the table gets activated. I added the MAC from the list of Computer names. The I also created new rule in Schedule named "tt" but none of this is working. As said I want to create rule for these 2 devices for specific time duration access. Help me achieve my aim. 3. Use Advanced/Access Control configured and apply the customized schedule to a policy and to the PC(s) or device(s) desired to be controlled. 4. Ensure Time is set correctly on the router. Tools/Time. I do believe Setup/Networking/DNS Relay and or Setup/Internet/Manual/Advanced DNS Services need to be enabled along with configuring Reserved IP addresses, Scheduling, and Access Controls.